Artwork Panel: 50.5cm x 98.8cm ≈ 19¾" x 38¾"
Silk/Brocade: 60.2cm x 154cm ≈ 23¾" x 60½"
Discount Asian Art! Reason for discount: Minor watermark and marks in silk. 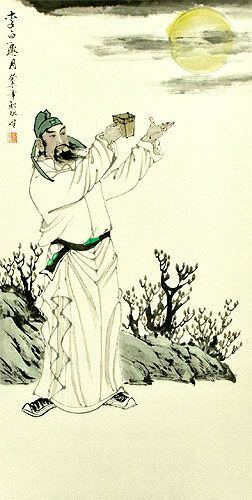 Li Bai was a famous Chinese poet during the Tang Dynasty. His most well-known poem was about wine. I presume he is holding high, a cup of wine in this image. 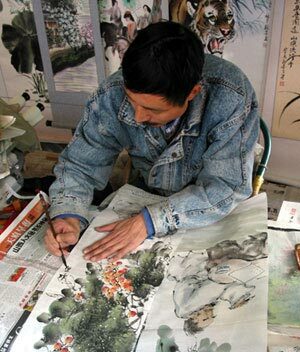 This is an elaborate style painting using special black Chinese ink and watercolor on xuan paper (rice paper). This rice paper was then taken to our mounting shop in Beijing where a hand-made silk wall scroll was created for this painting. This wall scroll then flew with me from China to the USA and is now located at our San Diego, California gallery, ready to be shipped to you. 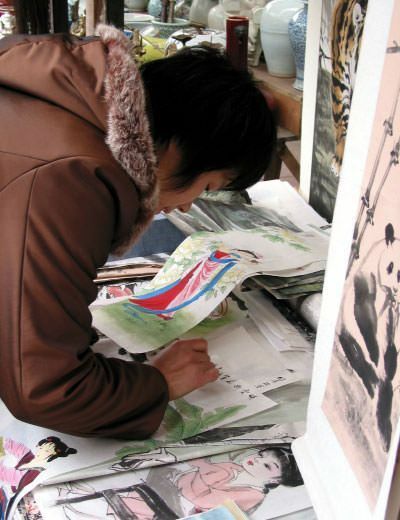 The artist places her "chop" (signature stamp) on one of the wonderful pieces of artwork that she created meticulously by hand. Visiting an old friend and artist in Chengdu, I notice a woman is politely waiting for me. Soon enough, I finish my business, and leave my friend to work on some art that I would pick up several days later. The polite woman greets me as I walk out. She quietly asks if I would just take a look at her artwork. I walk over to her little booth and take a look. The work is good, and I am surprised that she doesn't have a studio-gallery like a lot of artists. 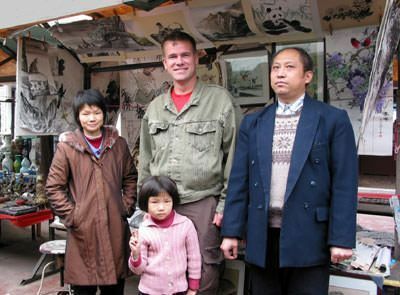 She says that she likes to sell in the market, and put paintings in the hands of "the common man". It is then that I realize we have a similar philosophy. I look through her whole collection, and pick out several pieces that I like. Her husband shows up, and I find out that he too is an artist. I end up staying a few extra days with these two artists as they create a couple of custom paintings for me. The quality of their work is wonderful and I'm so glad I didn't miss the chance to meet them. Liu Da-Lu with her husband and daughter. As usual, I am the "non-Chinese-looking guy" in the picture. The artist's name is Liu Da-Lu. 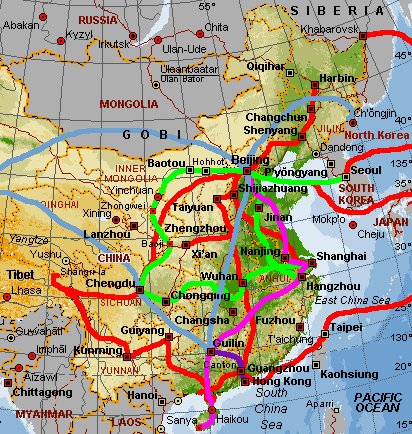 She lives with her husband and young daughter near Chengdu, in the Sichuan province of China. As if fitting the stereotype, her husband loves to paint dragons and warriors, but she paints beautiful women, flowers, landscapes, and animals. They both live the simple life of artists. Both of them have the attitude that the art itself is more important than money. The honor of knowing that their work will now be on the walls of homes throughout the world is the thing they feel strongest about. 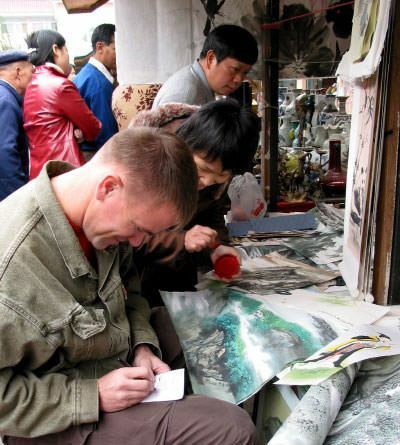 I take down many notes about the artist, and her paintings as I sit in her little shop in the arts & antiques market just outside Chengdu.